Whirlpool WHKF-GAC Under Sink Main Faucet Filtration Drop-In Replacement Filter reduces chlorine and other contaminants that effect water taste and odor. The universal dimension of 2.5 x10 inch insures that this cartridge is compatible with such filter manufacturers as Culligan, Cuno, Ametek and most others. This cartridge dimension is ideally suited for point of use applications. The cartridge should be changed every 6 months or upon substantial flow rate reduction. Q: How often should I change this system? A: You will need the canister wrench to replace the filter and a container to catch excess water. Open the faucet and let the water run. Turn off the water using the cut off valves under the sink. If you dont have cut off valves or they dont work properly then you will have to turn off the water at the water meter. You have to release the pressure inside the canister by pressing the pressure release button on top. Once the pressure is released you can then proceed to unscrew the canister using the wrench. 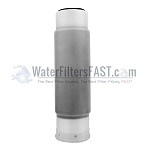 After unscrewing the canister by hand, remove the old filter and replace it with the new filter. Install upright. Re-assemble the canister with your hand and tighten with the wrench. Turn the water back on and check for leaks. A: I have my filter mounted in a 41' Meridian Powerboat, but the process should be the same. Turn off the water, and slowly spin the filter cover counterclockwise. Replace the new element, fill with water, and screw on clockwise. A: May vary with filter housing: 1. turn off water. 2. Press pressure release button, if one exists. 3. Use provided wrench to remove base of filter. 4. Remove old cartridge noting the bottom verses top. 5. Rinse and clean lower filter housing. 6. Inspect gasket, clean and reinstall with petroleum jelly. 7. Insert new cartridge with bottom down. 8. Reinstall bottom housing to filter, tightening just a little after hand tight. 9. Turn water back on and inspect for leaks 10. Run water for a few minutes to remove charcoal particles. A: I have used this filter for about 5 years. I replace mine every 6 months, my water always tastes good, but right after I replace the filter it just tastes even more fresh. A: This cartridge is recommended to be changed every 6 months. A: I change the filter out every 6 months. A: Already have a system that take these filters and they provide me with very clean drinking water. A: This is the type of cartridge my under sink filter needs. Can't buy it a Home Depot anymore. Q: What are the steps to replace the old filter?